Bucks stormed past Pistons in the opener. Bucks players were unselfish on offense dishing 31 assists. They brought some defensive toughness making 8 blocks. 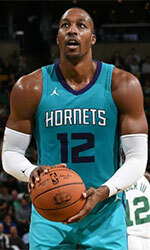 Worth to mention a great performance of Greek-Nigerian swingman Giannis Antetokounmpo (211-94, agency: Octagon Europe) who helped to win the game recording a double-double by scoring 24 points, 17 rebounds and 4 assists. Forward Khris Middleton (203-91, college: Texas A&M) contributed with 14 points, 5 rebounds and 4 assists for the winners. Five Bucks players scored in double figures. Guard Luke Kennard (196-96, college: Duke) answered with 21 points and center Andre Drummond (208-93, college: Connecticut) added 12 points and 12 rebounds in the effort for Pistons. The winner was already known earlier in the game, so both coaches allowed to play the bench players saving starting five for next games. Magic held off Raptors to surge ahead in the series. Magic made 18-of-20 free shots (90.0 percent) during the game. Point guard DJ Augustin (183-87, college: Texas) stepped up and scored 25 points and 6 assists for the winners and Aaron Gordon (206-95, college: Arizona) chipped in 10 points and 10 rebounds. At the losing side Cameroonian forward Pascal Siakam (206-94, college: N.Mexico St.) responded with 24 points, 9 rebounds and 4 assists and forward Kawhi Leonard (201-91, college: San Diego St.) scored 25 points and 6 rebounds. Both teams had five players each who scored in double figures. Nets shocked 76ers in the opening game. Nets made 24-of-26 free shots (92.3 percent) during the game. DAngelo Russell (196-96, college: Ohio St.) fired 26 points and 4 assists for the winners. Forward Ed Davis (208-89, college: UNC) chipped in a double-double by scoring 12 points and 16 rebounds. Five Nets players scored in double figures. Swingman Jimmy Butler (201-89, college: Marquette) produced 36 points (!!!) and 9 rebounds and Cameroonian center Joel Embiid (213-94, college: Kansas) added 22 points, 15 rebounds, 4 assists and 5 blocks respectively for lost side. Both coaches tested many bench players and allowed the starting five to rest. Celtics defeated Pacers to take 1-0 lead. Celtics made 18-of-22 charity shots (81.8 percent) during the game. Celtics outrebounded Pacers 55-42 including a 48-33 advantage in defensive rebounds. Australian-American guard Kyrie Irving (190-92, college: Duke) nailed 20 points, 5 rebounds and 7 assists for the winning side and forward Marcus Morris (206-89, college: Kansas) accounted for 20 points and 7 rebounds. Five Celtics players scored in double figures. Lithuanian-American power forward Domantas Sabonis (209-96, college: Gonzaga) came up with 7 points and 9 rebounds and forward Thaddeus Young (203-88, college: Georgia Tech) added 7 points, 6 assists and 5 steals respectively for Pacers in the defeat. Both coaches used bench players which allowed the starters a little rest for the next games. Warriors are 1-0 up on the Clippers following a comfortable home win. Warriors made 17-of-20 free shots (85.0 percent) during the game. Warriors outrebounded Clippers 53-40 including 42 on the defensive glass. They looked well-organized offensively handing out 31 assists. Great defensive blocking was one of the keys in this match when Warriors made 14 blocks. Point guard Stephen Curry (190-88, college: Davidson) stepped up with a double-double by scoring 38 points (!!! ), 15 rebounds and 7 assists for the winners and forward Draymond Green (201-90, college: Michigan St.) chipped in 17 points, 7 rebounds and 7 assists. At the losing side Lou Williams (185-86) responded with 25 points and 9 assists and forward Montrezl Harrell (203-94, college: Louisville) scored 26 points and 5 rebounds. Four Clippers players scored in double figures. Both coaches allowed to play bench players saving starting five for next games. Spurs toppled Nuggets to gain 1-0 lead. Swingman DeMar DeRozan (201-89, college: USC) stepped up with a double-double by scoring 18 points, 12 rebounds and 6 assists for the winners and guard Derrick White (196-94, college: Colorado) chipped in 16 points and 5 assists. At the losing side Serbian center Nikola Jokic (209-95, agency: BeoBasket) responded with a triple-double by scoring 10 points, 14 rebounds and 14 assists and Will Barton (198-91, college: Memphis) produced a double-double by scoring 15 points and 10 rebounds. Both teams had five players each who scored in double figures. Trail Blazers outlasted Thunder in Game 1 of the series. Trail Blazers made 21-of-27 free shots (77.8 percent) during the game. Great defensive blocking was one of the keys in this match when Trail Blazers made 9 blocks. Thunder was plagued by 26 personal fouls down the stretch. Turkish center Enes Kanter (211-92, college: Kentucky) stepped up with a double-double by scoring 20 points and 18 rebounds for the winners and point guard Damian Lillard (190-90, college: Weber St.) chipped in 30 points and 4 assists. Trail Blazers' coach used a ten-player rotation in such tough game. At the losing side point guard Russell Westbrook (190-88, college: UCLA) responded with a triple-double by scoring 24 points, 10 rebounds and 10 assists (made all of his eight free throws) and swingman Paul George (206-90, college: Fresno St.) produced a double-double by scoring 26 points and 10 rebounds. Both teams had four players each who scored in double figures. Rockets steamrolled Jazz to open win count in the series. Rockets dominated down low during the game scoring 66 of its points in the paint compared to Jazz's 46. They looked well-organized offensively handing out 25 assists. 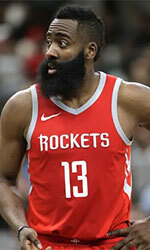 James Harden (196-89, college: ASU) stepped up with a double-double by scoring 29 points, 8 rebounds and 10 assists for the winners and Swiss power forward Clint Capela (208-94) chipped in 16 points and 12 rebounds. At the losing side French center Rudy Gobert (216-92) responded with a double-double by scoring 22 points and 12 rebounds (on 8-of-10 shooting from the field) and guard Donovan Mitchell (190-96, college: Louisville) scored 19 points and 5 rebounds. Five Rockets and four Jazz players scored in double figures. Since the result was very predictable, it gave the chance for the coaches to test many bench players and allowed the starting five to get some rest.